Very simple soba noodles made with 100% soba flour. 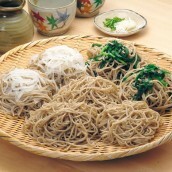 Iya soba is handmade soba made with soba flour made in a mysterious land of Iya. 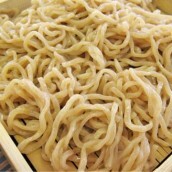 It is made with 100% soba flour with no binding agent, thus the soba easily falls apart, and it is thick and short. Iya soba is served at all the celebrations except wedding ceremonies because soba is easily cut apart that might lead to "cutting apart the relationships." 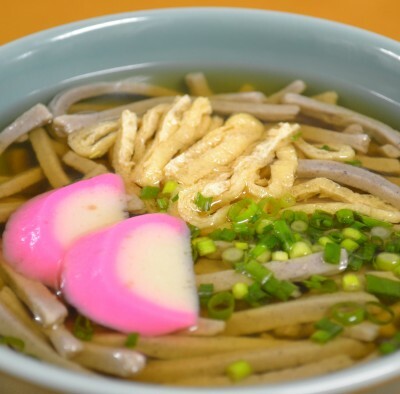 The aroma of soba spreads into your mouth with the first bite, and you can enjoy the simple but rich flavor of soba. Shift soba flour. 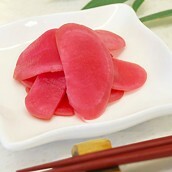 Cut kamaboko into bite-sized pieces, and cut aonegi into small pieces. Quickly soak aburaage in hot water to remove excess oil, and cut into thin slices. Add water to soba flour little by little, and mix them. Knead the crumbles of soba for about 100 times. Roll out the soba dough, carefully fold and cut into thin slices. Soak dashi kobu (roughly wape with dry cloth) and kaniboshi in a dashi bag in water for 2 to 3 hours. Put katsuobushi in a dashi bag and set aside. 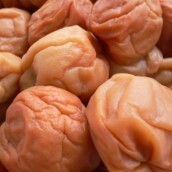 Put the bag of kobu and niboshi and water in a pan, put on the heat, and remove the bag when bubbles come around kobu. Add katsuobushi once water comes to boil, and remove from the heat after 2 to 3 minutes. 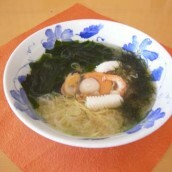 Add seasonings to dashi to make soba tsuyu. Cook soba in plenty of hot water for 2 to 3 minutes. Drain and put in a bowl. Put aburaage, kamaboko and negi on top of soba, and pour dashi. 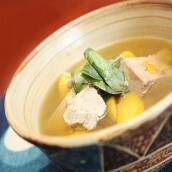 * Seasonal mountain vegetables could be added depending on the season.